After being designated the region’s highest level trauma center, St. Joseph Health System is now investing more than $20 million into a new facility to house our trauma program. 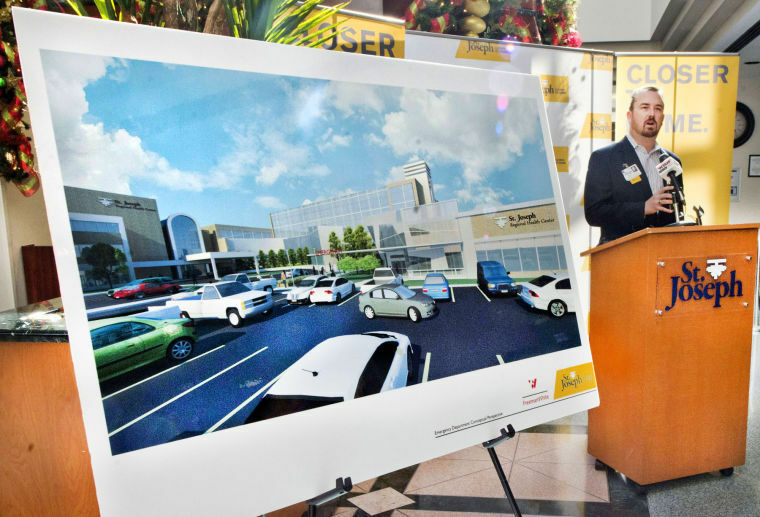 Called the St. Joseph Emergency and Trauma Center (ETC), the St. Joseph ETC will be built on the campus of our Bryan hospital, St. Joseph Regional Health Center. The number of trauma patients St. Joseph cares for has steadily increased since our Level II Trauma Center designation. In addition, according to CDC data, St. Joseph’s emergency department cares for patients more acutely ill than national averages. The new, larger facility will improve patient flow and reduce wait time. St. Joseph’s ETC will also be strategically designed for specialized, clinical teams to deliver personalized care. Dr. Brandon Lewis, VP of Medical Affairs and Medical Director of Emergency Services at St. Joseph. “We have been working on building the trauma program and now we need the physical space to accommodate our increasing trauma volume,” said Adair de Berry-Carlisle, D.O., F.A.C.O.S., medical director of the Level II Trauma Program at St. Joseph Regional Health Center. St. Joseph will finalize design of the new facility in early 2014, though renderings of what the ETC could look like are available. Construction will start in the spring and is expected to finish by mid-2015. This will provide a comfortable environment that will allow us to serve patients in larger, private rooms – with more space for loved ones patients want nearby in an emergency. Our current emergency department is undersized for the number of patients we see on a daily basis. St. Joseph is not licensed to provide in-patient psychiatric care; these patients must be stabilized and transferred. The shortage of local in-patient psychiatric beds sometimes creates extended wait times. Our new ETC will include rooms with safety measures specifically for these patients. Provide more space to support our EMS partners. St. Joseph Regional Health Center receives ambulance transports from more than 15 counties across the Brazos Valley. On average, our Emergency and Trauma Center receives 1.4 patients per hour by ambulance or just over 33 patients by ambulance every day. Our new ETC will include a private workspace for EMS staff to finish paperwork. Over the years, St. Joseph has made modest renovations to handle continual increases in patient volume. During one of the renovations, the public connecting corridor to the main hospital was removed to allow the ER to expand. Convenient access from the ER to the rest of our campus is part of the new building’s plan.